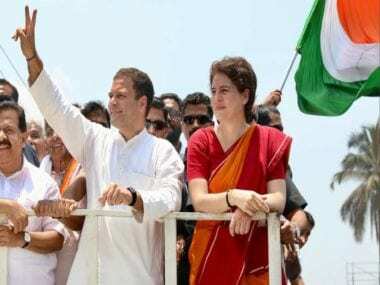 Delivering scathing attacks against Congress and soon-to-be party chief Rahul Gandhi, Prime Minister Narendra Modi, who is in Gujarat to campaign for the upcoming election, said that the grand old party always had an animosity for Gujarat and that Gujaratis must decide the destiny of the state by voting on 9 December. On the second-day of his two-day visit to poll-bound state, Modi addressed a rally at Malanpada in Dharampur, a Congress bastion. Addressing the gathering, Modi slammed Rahul Gandhi's expected elevation as Congress president, dubbing it as "Aurangzebi raj". Modi's Aurangzeb jibe came after BJP IT cell chief Amit Malviya tweeted out senior Congress leader Mani Shankar Aiyar's quote to a TV channel. The party veteran compared the Congress to Mughal era and about Rahul's elevation said, "Was their an election process to chose Shah Jahan after Jehangir? Or was their a poll to elect Aurangzeb after Shah Jahan?" Within 42 minutes of airing these quotes, Modi and the BJP caught on to the faux pas and attacked the Congress election process as a sham. At his rally, the prime minister also attacked the Congress for its dynastic politics. Modi said, "Mani Shanker Aiyar, who was a minister in the Congress government said 'did elections happen during Mughal rule? After Jahangir, Shahjahan came, was any election held? After Shahjahan it was understood that Aurangzeb would be the leader'. Does the Congress accept that it is a one family party? We don't want this Aurangzebi Raaj (Aurangzeb's rule)....For us, country comes first, 125 crore people of this country are our high-command." 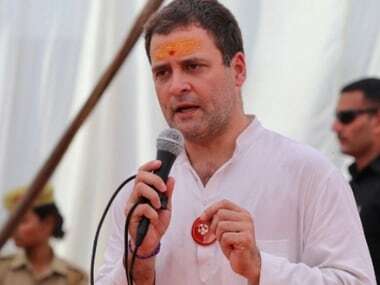 Rahul Gandhi is all set to take over as the Congress president next week and he has filed his nomination papers on Monday for the post amid opposition jibes over dynasty politics, in a contest with no one else in the fray. At a campaign in Valsad, without directly referring to the National Herald case, in which Rahul Gandhi got bail, Modi said, "Congress has gone bankrupt, as it is going to make a person who is out on bail in corruption case its president." "You (the UPA government) could not even handle Kashmir. But Sardar did yeomen service by unifying all rajas in India. Morarji fought for Prime Ministership. But he was jailed and thrown out like dirt," Modi said while slamming dynasty politics in Congress. Attacking Congress over the poll rout that the party faced in recently-concluded Uttar Pradesh civic election, Modi said that the Congress has been wiped out in the state. "The people of Uttar Pradesh have now recognised the Congress and have wiped out them out, who ruled the state through five dynasties. Now, the Congress has accepted that they cannot harm Modi in 2019 and now they don't have anywhere to go," the prime minister said in Dharampur. "So, their target is to malign Gujarat. The Congress has always made people fight against people, tribal against tribal, educated against uneducated, communities and so on. 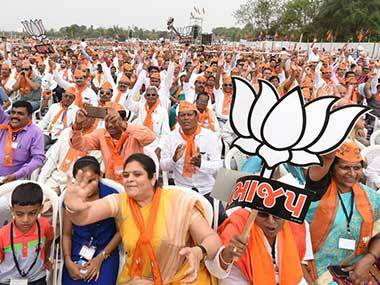 But the people of Gujarat have rejected such a disruptive party," Modi said at the rally. Raking up corruption in the Congres, Modi asked the crowd whether they were angry because of demonetisation. The crowd shouted 'no'. "It is only Congress which is angry due to the note ban as they have lost their opportunity to loot the poor in India. They cry because I have acted against them. I am here for the poor. Every money in India is for the poor, adivasis, Dalits, farmers and workers." Referring to the temple visits of the Gandhi scion in Gujarat, Modi said, "Look at the strength of the land of Sardar and Mahatma Gandhi, that after 70 years they have started visiting places like Somnath mandir. But people won't be fooled by that. There is a conspiracy to insult Gujarat and Gujarat won't tolerate." "The Congress dynasty which has reigned in Uttar Pradesh for the past five decades, but have we ever maligned them, insulted them? Insulted other states? But not a single day passes when every Congress leader curses Gujarat. What is our fault? They cursed Sardar Patel. What was his fault? That he worked for the good of the country?" "Do these people defame Uttar Pradesh, Bihar, Rajasthan and West Benagl? But Congress used to defame and insult Gujarat. 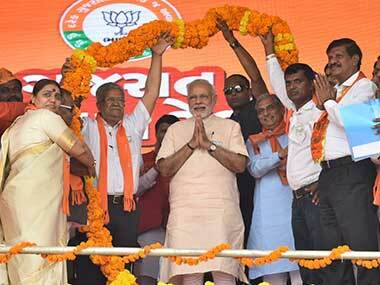 Every Congress leader usued to at least insult Gujarat once a day," Modi said in the Dharmapur rally. Continuing in the same vein, Modi said, "Indira Gandhi had our Morarji Desai jailed for months. Why such animosity for Gujarat? Gujarat should teach them a lesson that they stop insulting Gujarat. Gujarat has never been on anybody's mercy." Alleging the Congress of not doing anything for the Other Backward Castes (OBC), the Scheduled Caste (SC) and Scheduled Tribes (ST), Modi said, "All the previous governments did not do anything for these communities. As soon as our government was formed, we granted constitutional status to the OBC commission. Congress had halted that bill in the Rajya Sabha. I don't have to go and learn what backward living is." "These people talk a lot of OBCs.. but I want to tell the OBCs of south Gujarat that Congress is lying and renegading on promises. Our MP met Manmohan Singh on giving constitutional status to OBC commission but nothing came out of it," Modi said in Dharmapur. The prime minister further added, "Why did the Congress not give Constitutional Status to the OBC Commission? We got a bill but when we did so, they stalled it in the Rajya Sabha. This anti-OBC Congress should be severely punished by the people." "Not only did the Congress ignore the healthcare infrastructure in tribal areas, there was no arrangements for ambulances. We changed both these things- today there are better healthcare services and the 108 ambulance service is active," said the prime minister. "Why has the Congress stopped saying BJP is anti-Muslim? Earlier, they would go out of the way to show their secularism but now we are all seeing what they are doing in this election, where they are going. Unfortunately for them, Muslims know their real nature," Modi said in Dharampur. "On 9 December, you have to decide the destiny of Gujarat. The vote is against those who hate Gujarati people, Gujarat state, its name itself. 9 December is the date when you can teach a lesson to these people who are defaming Gujarat," Modi added, referring to the first phase of voting for the Gujarat Assembly elections. Attacking the party over several corruption cases, Modi said, "Have you ever read in newspapers that Modi took away so much money for himself? For his brother, for his relatives? Whereas what was on the other side — scams of loot in coal deal, helicopter deal, why? Since Modi is in Delhi, he has stopped all such loot. Instead, now people ask what did Modi bring in," Modi asserted. He also slammed the Congress for opposing demonetisation, "It has been 12 months since note ban, why are Congress party's tears not drying?" he asked at a rally in Bhavnagar. "Congress is angry with me for demonetisation. Tell me are you angry with me for demonetisation?" Without waiting for the crowd's response, Modi went to say, "The Congressmen are worried that their scam money, corrupt money has gone. They are angry that Modi looted us. But remember all the looters of the country, Modi will extract every penny out from you and use it for the common man of the country. The money belongs to the country." Modi also added the Congress learnt disruptive politics from the British colonials. "Congress is trying to create fights between brothers, between cities and villages, between religions and castes, whatever chasms that they could create, Congress party has learned this sin from the British Raj rather well." The prime minister said even the Congress has accepted that the BJP is not an anti-Muslim party, as unlike in the past elections, it is not branding BJP leaders communal this time. "If you remember 2002, 2007, 2012 (polls), all Congress leaders would brand us as communal and anti-Muslim. But before the 2017 polls, no leader is saying that BJP is communal. This means the Congress has also accepted that the abuse they were hurling against the BJP was false and was meant for vote bank politics," he said. Urging the gathered crowd to vote for BJP, Modi said, "I can see the target of achieving 150 seats for the BJP being fulfilled right in front of my eyes. You will be deciding the fate of Gujarat on the 9th and you will have to punish the people who have disliked Gujarat." Polling for the two-phase elections in the state, which has a total of 182 seats, will take place on 9 and 14 December. The votes for Gujarat Assembly elections will be counted on 18 December. 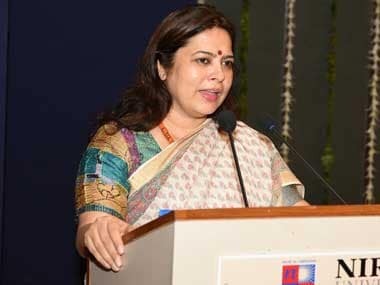 Eighty-nine seats of Saurashtra and south Gujarat region are going to polls in the first phase, while the remaining 93 seats in the central and northern region would vote in the second phase.